Three people are being treated by paramedics after a two-car collision in Hastings this evening (Thursday), according to Sussex Police. Police said 'all emergency services' are on the scene of the accident at Harold Road, which is blocked both ways. 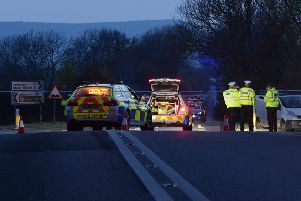 A police spokesman said: "We have no update on the extent of the injuries, but there are three causalities being treated in the back of an ambulance and the road remains blocked." Traffic reports claim one of the vehicles overturned after the accident.